I have given you several tools, mostly FREE, that you can use to get your business moving forward and saving you a lot of time and effort. No more having to reinvent the wheel or doing it all with paper and pencil. Now it is time for you to take action. The elephant in the room is a big question. Can I really do this? The answer is yes. All you have to do is dump the head trash that tells you that you can’t. Dump the trash and get on with it. Get rid of the head trash! Does social media management cause you some anxiety? Do you find yourself running around thinking about what to tweet or what to share on Facebook? Do you sometimes realize the end of the day is approaching and you still haven’t posted anything? Buffer lets you create and schedule content when you have time and then posts it on your behalf according to the schedule you set. In this way, Buffers allows you to manage all of your accounts in one place, saving time. You can choose the dates and times you want to publish to each social media account, and you’re good to go. You can schedule posts directly from Buffer’s website, through a plugin, or via your newsreader. Buffer also lets you collaborate with your nonprofit team, which is especially useful when you have one person providing photos, someone else creating blog posts, and another person interacting with the supporters. Since Buffer enables you to post frequently and consistently with minimal effort, it can help you build a stronger following. Its analytics tools will also evaluate your posts to deduce the best possible times to share your content. Buffer also makes reporting a breeze since you’re able to track key engagement metrics very easily. Their blog is amongst the best ones in the business, and their support team is available and helpful. Buffer offers Starter Plans at $0 and $15 each (where the free plan allows you to manage three social media accounts). Slack is completely free to use. If you’re tired of getting buried in endless emails and you’re starting to feel confused about who replied to what and in relation to which project, Slack is the right tool for you. Slack is considered a “messaging app”. 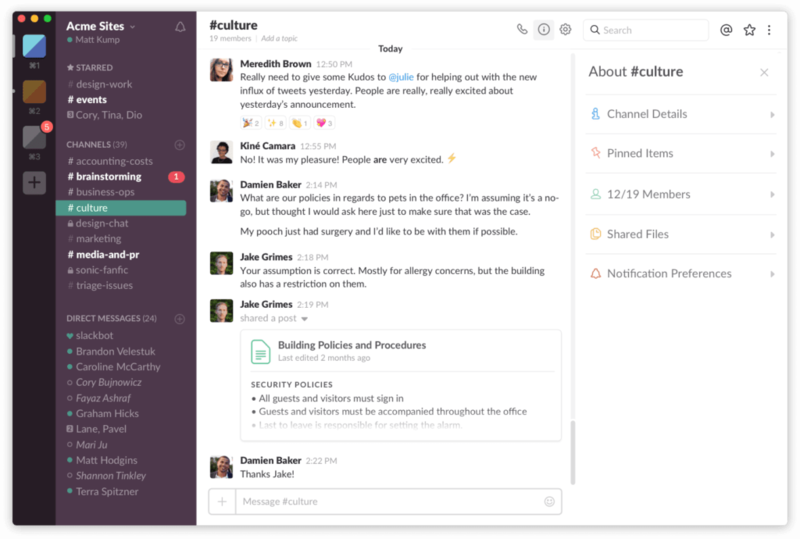 The idea behind Slack is to make communication and collaboration between coworkers easier. The system is structured somewhat similarly to social media. There are ‘channels’ on the left side – you can create a channel for a project, a team, or an idea. When you create a channel, everyone can see what is going on in that channel. These are called “open channels”. You can also create private channels where you can share confidential information with just a few team members. You also have the option of sending direct messages in order to reach one coworker quickly and directly. Slack keeps all of your team communication in one place so that all the emails, Whatsapp, or even Facebook and Skype messaging can reduce or end. This makes your team less likely to get lost in dispersed communication. Another advantage to Slack is that it can be integrated with many other web services: Google Drive, Trello, Asana, Dropbox, to name but a few. You can share files, spreadsheets, links and more. You can search in Slack, as well as make calls and share your screen. Slack is completely free to use. The first paid option starts at just $8 monthly per user. Loom brings the richness of video to work. Capture your screen, record your front-facing camera, and narrate it all at once, then instantly share with a simple link. The cost $0.00 for this Desktop application compatible with both PC and Mac. When you show and tell, you make sure you’re understood. Your work communication is more personal with the nuances of tone and facial expression. Skip the back and forth over email and chat. Whether you’re training a new teammate or replying to a customer inquiry, Loom helps you send the next best thing to being there. What is a mind map and why should you use one? A mind map is a graphical representation of ideas and concepts. It’s a visual thinking tool for structuring information, helping you to better understand, remember and generate new ideas, plans, and organizational charts. I use this program to map out my course work and downloads (charts) for my clients. It’s web-based so nothing to download, you can save your mind map as an image, share and collaborate with others, it’s a one click presentation, and is colorful and engaging. Bubbl.us works the same on all platforms, for both desktop and mobile. No need to download or install an app to use Bubbl.us. Simply, bookmark this page, or add it to your home screen on a mobile device. You may have heard of a concept called first-mover’s advantage or FMA. It means: If you’re the first one using a precise method or employing a specific approach, you win. The sooner you learn and use this new marketing tool, the more likely you are to profit from it. Right now, we’re in the stage of Facebook Messenger marketing where potential clients are not yet feeling things like “banner blindness” (web ads) or “email fatigue” (email marketing). Right now, we’re in the stage of Facebook Messenger marketing where potential clients are not yet facing things like “banner blindness” (web ads) or “email fatigue”. When you send a prospect a Facebook message, they’re far more likely to view and click through than they would with an email marketing message, because they are short, on their phone, and usually require a simple tap. People are answering Facebook Messenger messages in record-high numbers. I know for a fact that you can get 50%+ open rates on your Facebook Messenger bot campaigns. I’ve seen the proof, and I’m a believer. Don’t delay. The iron is hot and it’s time to strike! I ran across this post just the other day and found it extremely interesting as I am looking at other, newer, was to communicate with my clients and perspective clients. I realize it’s a bit long, but it’s a good read. Myth: People hate being marketed to via email. In all actuality, research supports that people read most of their emails and do not mind frequent emails as long as they are relevant, interesting and specific to their needs. Email marketing gets a bad reputation as one of the more spammy marketing channels. The Federal Trade Commission even governs how businesses can send emails to consumers via its CAN-SPAM Act, which establishes requirements for commercial messages, gives recipients the right to unsubscribe and spells out tough (read: up to $41,484) penalties for violations. So, what is one of the biggest ways this will impact marketers? Under GDPR, organizations can only email those who have consented (opted-in) to receive email. Failure to comply could mean fines exceeding 20 million Euros or 4% of annual global turnover (whichever is higher). But this does not mean email is dead. A whopping 59% of B2B marketers report that email marketing is their most effective channel for generating revenue, and marketers continue to find ways to innovate (emojis in subject lines, anyone?). You Should Use Facebook Live, Why? Signup below and we’ll email you the details right away.